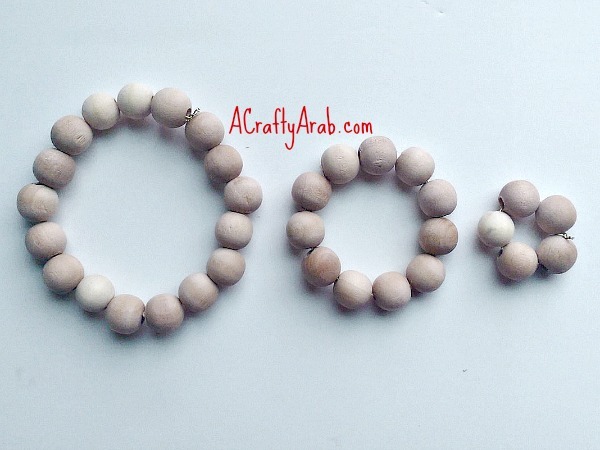 When we create new crafts here on A Crafty Arab blog, it’s always fun to think of ways we can reproduce the different Arab flags. We thought we would try the Yemeni flag (Arabic: علم اليمن‎‎) . The Republic of Yemen is the second largest country in the Arabian Peninsula. It is bordered by Saudi Arabia to the north, the Red Sea to the west, the Gulf of Aden and Arabian Sea to the south, and Oman to the east-northeast. Yemen’s territory includes more than 200 islands. The Yemeni flag is made up of three colors: red, white and black. The red stands for the bloodshed of martyrs and unity, the white for a bright future and the black for the dark past. On May 22, 1990, North Yemen and South Yemen were unified and the current flag was adopted. Yemen joined the Arab League on on 5 May 1945 and the capital is Sana’a. Today we thought we’d create a Yemen flag trivet. A trivet is an object placed between a hot bowl or tea kettle, and a wood surface, to protect it from damage. 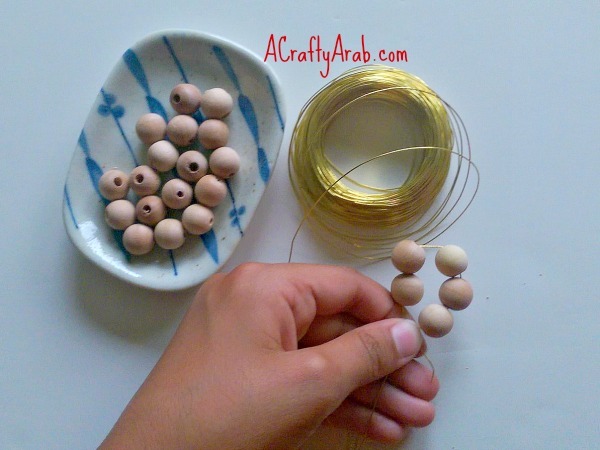 We started by stringing our small beads with the wire. We used five wood beads, but you might use more or less, depending on how big you want your trivet. Our trivet is miniature size in the photo, but you are welcome to use larger beads if you’d like to make this a trivet for a serving dish or bowl. Twist the wire closed and cut off ends. 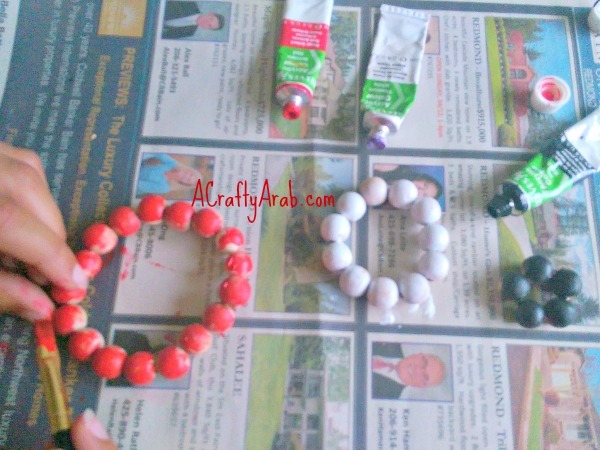 You’ll need to string a second and third circle of beads, making each one larger to fit around the smaller circle. 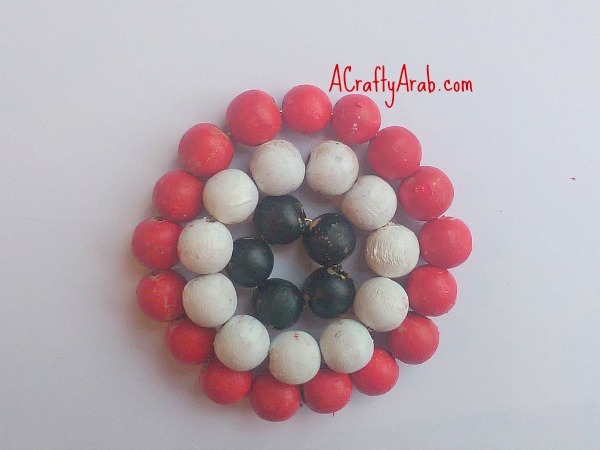 Paint the smallest circle black, the middle size white and the large red to represent the three stripes of the Yemen flag. Your three circles will now look like this. Place the three circles in each other. Wire a few beads from each size to each other to secure the circles. Now your Yemeni flag trivet is ready for your teapot and this afternoon’s tea party! 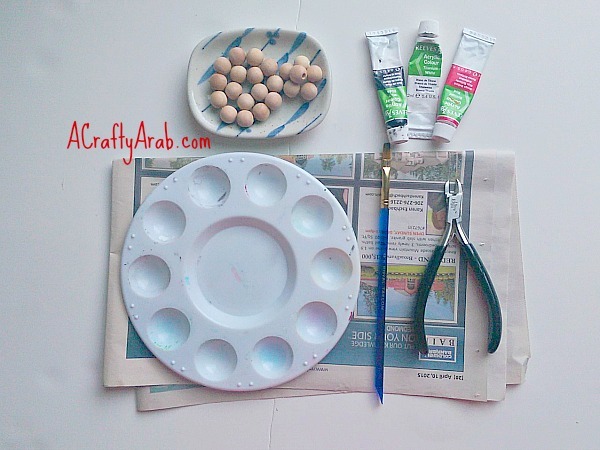 Stop by for more DIY tutorials that cover the countries of the Arab League at ACraftyArab on Pinterest.